Between you and me, there are certain corners of Fallout 4’s browner-than-brown Commonwealth that are less than polished. Look around in folks’ houses and you’ll see plates casually glitching through counters. Take a morning constitutional from Sanctuary and every now and again you’ll find a tree floating in the air, brazenly challenging your notions of order and nature. It’s these minor but multitudinous bugs that start to drive you crazy as you spend any length of time in Fallout 4, and in an effort to squash every single one of them, the community has begun a crowdsourced unofficial patching project that aims to polish Bethesda’s post-atomic RPG up to spit-shine levels. Can’t be bothred waiting for the patches to improve Fallout 4? Check out the best RPGs of all time, instead. – Hundreds of gameplay, quest, NPC, object, item, text and placement bugs fixed. – Created by the authors of the Unofficial Oblivion and Skyrim Patch series. – No unsafe changes (such as deletions of stock objects). – Designed to be compatible with as many other mods as possible. Unofficial Patch Project Team did indeed work on previous Bethesda titles to squash their myriad bugs, so you’d imagine they’ll be that bit more well-versed with the percularities of that studio’s code every time they tackle it, and will thus be able to work quicker to achieve ever more impressive results. In order to do so, they’re reaching out to the community for help. If you’d like to report a bug to them, here’s a handy and very specific guide on how to do so. 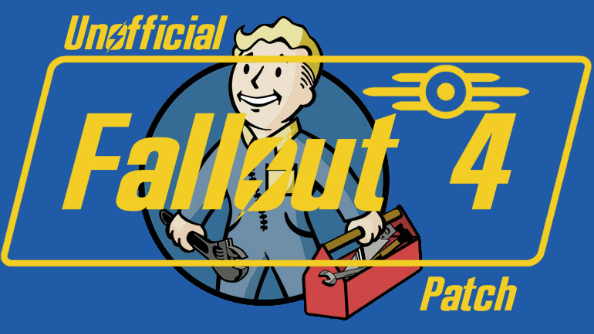 Bethesda themselves have patched Fallout 4 numerous times since launch, and in fact you’ll need to patch the game up to v1.5.146 or later in order to use this unofficial patch. Clear? Clear. If you use a lot of mods with your game, you’ll need to arrange those mods in a particular load order to ensure compatibility too. Details are all on the Nexus page above.